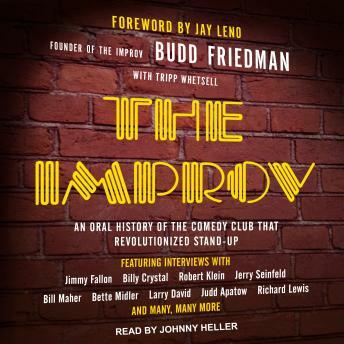 In 1963, thirty-year-old Friedman-who had recently quit his job as a Boston advertising executive and returned to his hometown of New York to become a theatrical producer-opened a coffee house for Broadway performers called the Improvisation. His goal? Simply to make a living, and if all went according to plan, to also make enough professional contacts to be able to mount his first Broadway show within a year's time. Later shortened to the Improv, its first West 44th Street location in a seedy section of Manhattan's Hell's Kitchen had previously been a Vietnamese restaurant. Initially attracting the likes of Judy Garland, Liza Minnelli, Albert Finney, Christopher Plummer, and Jason Robards, as well as a couple of then-unknowns named Dustin Hoffman and Bette Midler, Friedman's new venture was an instant hit. But while it drew near capacity crowds almost from day one, it wasn't until comedians began dropping by to try out new material that the Improv truly hit its stride, not only becoming the first venue ever to present live stand-up in a continuous format, but in the process reinventing the art form and creating the template for all other comedy clubs that followed.